Trik-er-tude-wherein the intrepid triker finds enlightenment. To discover enlightenment the triker must first successfully pass through Phase 1-Fear followed by Phase 2-Acceptance and then onto Phase3-Trikertude. Our intrepid newbie triker has been lurking on the Bent Rider forum for some time now desperately wanting to be active again. 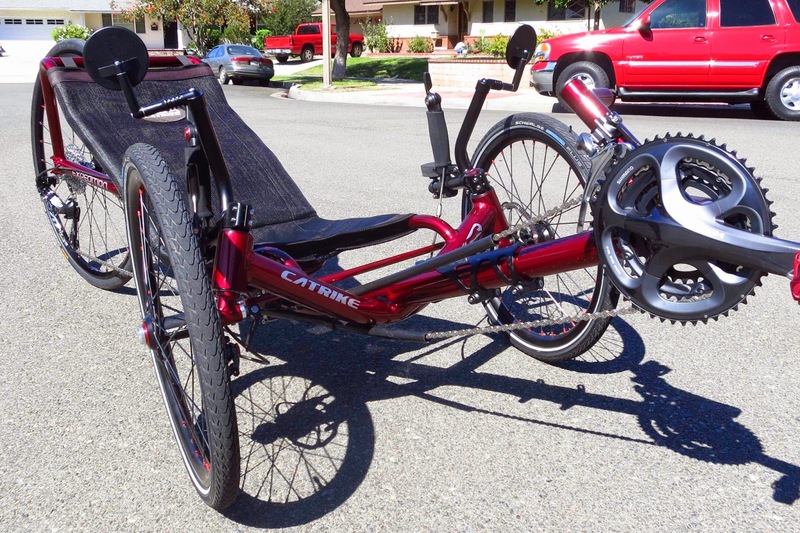 Our triker loves the idea of riding a tadpole recumbent trike (or maybe a Delta trike). but is dealing with the fear that overwhelms newbies to the triking world. On the practical side our triker asks, "Is it safe? Can drivers see me? Is it okay to ride in the streets?". And then there is the social fear that every new triker deals with, the dreaded "everyone one will be staring at me, I'll look like an idiot", kinda fear. With fear in check (thanks to Bent Rider forum members) our triker now boldly enters a recumbent dealer in (the City of your choice) and marvels at the site of the site of all the recumbent trikes and immediately feels a sense of rightness. After hours (maybe days) of checking out all the shiny new trikes our triker walks out of the recumbent shop and loads the new trike into the awaiting mini-van and heads home. It's now time for the first ride. So many decisions. 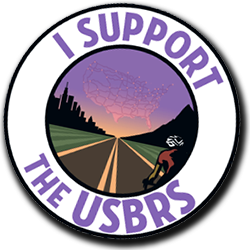 ""Do I ride on the road where every driver will be looking at me and trying to run me over or on the bicycle trail? But the trail has street crossings, what do I do then?" FLAGS AND LIGHTS!! "Yes that's it I'll look like a float in a parade with flags waving and lights flashing". Oh, but now the weird factor just got amped up. What to do? Ah "Grasshopper", every triker must find the path that is right for them. There is no wrong path. After a few rides our triker is settling into a zone where the desire to ride is overcoming the fear. Our triker is now ready for Phase 2. Without wasting time our triker is putting on the miles and the transition into Phase-2 has come quickly. Our triker has moved past fear and has accepted that drivers are not out to run you down. Quite the opposite. Drivers are giving more room to our triker and surprise, surprise, trikers are actually more visible simply because they look "different". Our triker has also accepted that drivers are staring, and some are probably making ignorant comments from within the protection of their tinted high horse powered cocoon. But to our triker's delight comments made by fellow cyclists and those who travel on foot are positive. Our triker now regularly cruises the roads and trials. With a good understanding of the rules of the road and an appreciation of cycling etiquette our triker has now accepted that he or she is part of the cycling world and expects to be treated as a cyclist. With complete acceptance our triker has mastered Phase 2 and soon moves on to Phase 3-Trikertude. YES...our triker has reached Trikertude and with that enlightenment. Every road and path is open. You have gone beyond the acceptance of yourself as a mere cyclist and now see yourself as a pioneer who has broke free of expectations and social norms. You exude confidence. So many are the cyclists for whom a traditional bicycle no longer suits them. Even though their body cries out for something better and smarter to ride they continue to ride what is expected of them. Others simply give up cycling. Trikertude is a state in which a triker has moved beyond the expectations of others and has developed a sense of self worth that acknowledges the right of an individual to enjoy their life in whatever manner they so please as long as their actions don't negatively impact others. To the contrary. Trikertude is further defined as a willingness to help others in a positive way by helping them to discover the joy of life again. Get out and ride a Trike! For short car trips I lash my trike to the top of the car. For longer road trips I want the trike inside the car. I needed a better way then just throwing the trike in the car, rear tire first, with the wheel pushing through the front seat and almost touching the dashboard. Taking the rear tire off provides more room but then the chain hangs loose and the trike has to be propped up so it doesn't sit on the rear derailleur. Here's my no cost light weight solution using stuff I already had lying around. Rear end sits on two small boxes (thank you USPS) duct tapped together and topped with an old inner tube. Quick release skewer and an old return idler serve to retain the chain. The skewer rests comfortably on the box. 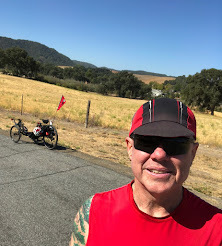 The Solvang Prelude in the Santa Ynez Valley (So Cal's wine country) November 8th will be my first event ride since 2011 when I did a short ride at the Cool Breeze Century in Ventura on failing hips. That little ride was followed a few months later by a heart attack. During 2012 and 2013 my hips kept fighting me and every event ride I registered for I had to bail out off. Finally after getting new hips in late 2013 (go to Post by Subject and click on Hip Replacements for the sorted details) I've come to the realization that I can commit to event rides again. Not the long century rides but the shorter rides offered at most events. The Solvang Prelude will be the first event ride I do this year. The Prelude includes a Metric and Half Century and a 26 mile ride. All with a bit of climbing. I'll just do the 26 mile ride. I'm not one to test how far I can go only to end up where I started or worse retrace part of a route I've already done earlier in the day. The Prelude rides do just that, especially on the longer rides. I like new scenery and the beer (or wine) that awaits me at the end of ride. Next year I have a few more event rides staked out. 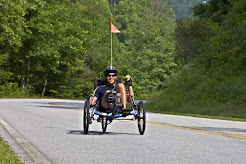 I contact the event organizer to make sure recumbent trikes are welcome. At first a couple of organizers responded like I was a child wanting to ride my tricycle with all the big two wheeled kids. One organizer said okay but gave me a lecture on how to ride safely with other bikes. Another said to stay out of everyone's way. The Fiesta "something or other" just said no. Now my contact with event organizers includes a picture of my Catrike "Black" and word or two about what a big boy I am and how long I've been riding. Responses so far are all positive and the organizers are more then happy to take my registration fee. I switched the front wheel set on "Red" with the front wheel set on "Black". My Catrike 700 "Black" is my performance 700 and "Red" is my cruising 700. Up to now the Chris King hubs were on "Black" but when I give them a spin they slow down noticeably faster then the Catrike hubs on "Red". The Catrike hubs spin easily and long. So I took off the tires and switched them around. Now the superior freewheeling Catrike hubs are on "Black". My Catrike "Red" is not built up for speed so it now sports the Chris King hubs. The Chris King hubs have about a 200 mile break in period and that period has come and gone a long time ago and they're still sluggish compared to the Catrike hubs. They look great but the axle did require the expert machining of Dana at Bent Up Cycles to get them to work with the Catrike spindles. I keep a detailed log of all my rides so in time I should be able to tell if there is a noticeable difference by comparing max speeds on certain hills where I spin out and gravity takes over. I'll update this post in the next couple of weeks. My conclusion...the proprietary front Catrike hubs are good hubs specifically designed by Catrike for it's trikes. It's not worth going with another brand hub for the front wheels. I un-switched the hubs. If there is any difference in performance between the Catrike hubs and the CK hubs then I sure can't tell. In the interest of aesthetics I put the CK hubs back on "Black" and the Catrike hubs are now back on "Red". Experiment over! It's hard to tell from the pic but the Chris King hubs protrude out on the side a little more then the Catrike Hubs. "NEW MULTI TRACK WORLD RECORD! With much excitement we announce Gareth Hanks has broken his own world record setting a new speed of 117.38km/h (72.94mph) In his Trisled 'All Overzealous' streamliner!" FAST TRIKE!! The WHPSC record at Battle Mountain for a bicycle is 83.13mph set by Delft last year and the multi-rack record is now 72.94mph. That's only a 12% difference. Trikes are here to stay!! On the other end of the spectrum the fastest diamond frame bike (limited to UCI regulations as to what defines a "real" bicycle) couldn't even come close to the speed of Trisled's "All Overjealous" piloted by Gareth hanks. You gotta love the speed, stability, comfort and the fun factor of trikes. I decided to escape the heat of the Conejo Valley and packed up Red and headed to the coast to explore the new La Conchita Trail. The La Conchita Trail is a 3.5 mile path that parallels Hwy 101 on the coast side just South of Rincon Beach. Up to recently cyclists had to ride on the very busy and noisy Hwy 101 and brave all the big rigs and cars travelling at 70 plus miles per hour. It was a daunting affair to say the least. The noise is still part of the ambiance of the new trail but now you can relax and enjoy the ocean on one side and try not to notice the busy 101 on the other. The total round trip was 25 miles of flatness starting at Emma Wood Sate Park and ending at Rincon beach. I had a picnic lunch at Rincon park and then went back. The La Conchita Trail is a great short path with nothing but ocean view (if you turn your head the right way). It's not a very wide trail and would have been nice to have some pullouts for us cyclists to be able to stop and enjoy the ocean view without having to block the trail. Even without pullouts it's still a really nice trail. There is only one minor street crossing and restrooms at the North end of the trail at Rincon Beach. Starting at Emma Wood Sate Park in Ventura I headed North after saying a rolling hello to a couple of other trikers (I can kick myself for not stopping to talk). My ride started on the Emma Wood Trail. Mile 0 to mile 1.2 was the Emma Wood Trail. Mile 1.2 to Mile 8.4 is along Hwy 1 9 (pretty rough pavement for most of the ride). Mile 8.4 to mile 12.0 is the La Conchita Trail. Unloaded and ready to go. I'm parked on a dirt strip just outside the Emma Wood State Park campground. Pump trunks driving by offering to pump out last night's burrito and tequila from your RV holding tank. Taking a break and enjoying the view now that I'm past RV row. Going under HWY 101 on the way to La Conchita Trail. Ocean view on the left. HWY 101 view on the right. A ramp leading to the beach is the only place to pull off the trail to take a look around. I rebuilt the entire crank for Red from existing crank parts and some new ones. I'm trying see if I can get by without having to go with a Schlumph Mountain Drive to achieve a comfortable climbing gear. With the rebuilt crank I now have a respectable 18.5 gear inches on the low end and 120.9 on the high end. The Schlumph has some drawbacks for me which I'll get into in a later post. The new crank is now a 48/39/24. The amount of chain needed to handle this crankset with a 36/11 cassette is right on the edge of what a long cage derailleur can handle. You can go up to a 50t on the crankset but if you don't want a loose, sloppy and noisy idle chain then you need to avoid going small/small (24t chainring/11t cog) with your gears. (note: chain length must first be adjusted to accommodate a largest chainring/largest cog gear combination). I left the front derailleur mounted higher on the derailleur mast then it might normally be mounted for a 48t large chainring. Mounting the derailleur a bit on the high side allows it to clear the outer guard. However my main concern was the angle of the shifting cable coming from the cable stop that Catrike mounts on the mast to accommodate a 52t large chainring. Moving the derailleur down on the mast increases the angle at which the cable exits the cable stop increasing wear. I've put a few miles on this crankset and the derailleur height on the mast seems to be non-issue. The shifting is smooth even when shifting down or up between the 39t and the 24t chainrings. When building up your own crank it's a good idea to have chainring spacers on hand. I get spacers here from Wheels Manufacturing Inc. I like this old style Catrike outer guard. The newer one is a bit plain. Gear inches with the re-built crankset. Kevin (aka Dkevdog at Bent Rider) recently bought my old Catrike Expedition and gave it a new life with this awesome makeover. Kevin striped it down and put on 4 new layers of powder coat. My old plain silver Cat is now a dark cherry metallic clearcoated beauty that Kevin's wife gets the pleasure of riding. Now Kevin's wife can ride alongside Kevin on his VTX (he takes it slow for her). My old Expedition gave me a lot of good times but she never looked as good as she now does with her makeup on. "Three Feet of Safety Act"
On the downside of this law (and there is a big downside) the fine for violating the law is a whopping $35. BUT if the car hits you and causes bodily injury (does that include death?) the fine skyrockets to $220. Well...it's a start. The entire California Vehicle Code relating to bicycles is here Division 11, Chapter 1, Article 4, Operation of Bicycles. Unfortunately the new Three Feet of Safety Act is not in the section relating to bicycles. It's in the another section here Division 11, Chapter 1, Article 3, Passing and Overtaking. So if a driver cares about bicycle safety and goes to the section Operation of Bicycles and reads about the rights cyclists have and thinks he or she now knows it all...well you know what I'm trying to say. I found a little bit of shade to park Red while I took a energy bar break.